Drivers who want more than just an outstanding look and lowering within the TÜV-tested adjustment range, will find the perfect suspension solution with our KW coilovers Variant 2 inox-line . 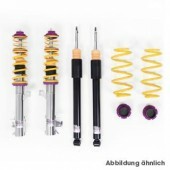 Not only stainless steel struts, corrosion-resistant components great durability, you have the possiblity to adjust the dampers to your own requirements in rebound (16 clicks) are good reasons to buy KW coilovers Variant 2 inox-line . At our headquarters in Fichtenberg each KW coilover Variant 2 inox-line kit is subject to extensive stress tests during production to meet the high standards of our KW quality management. 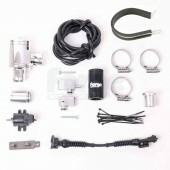 Every single damper and suspension kit is tested thoroughly. Of course, we give as a German manufacturer a 2-year warranty on our more than 4600 applications suspension solutions, which exceed OEM quality. The warranty will increase up to 5 years when the kit has been installed at one of our KW specialist dealers. Setup - Adjustable rebound damping with 16 clicks. 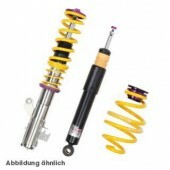 You have 16 clicks of adjustments with a KW coilover Variant 2 inox-line . The rebound adjustment changes the driving dynamics if the change the complete wheel set or install a set of winter tires. You can adjust the damping characteristics of the weather-resistant KW coilover 2 inox-line to be firmer or more comfortable, according to your own needs. The suspension is suitable for all competitive drivers who want more than just continous lowering for their driving pleasure. 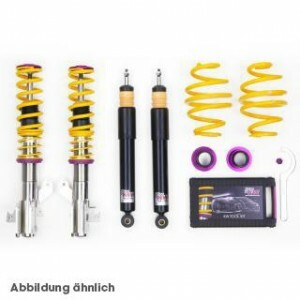 Click the button below to add the KW Variant 2 Coilover Suspension kit PUNTO to your wish list.